"The Deuter ACT Trail 22 SL Women's hiking pack is light, clean, and versatile. 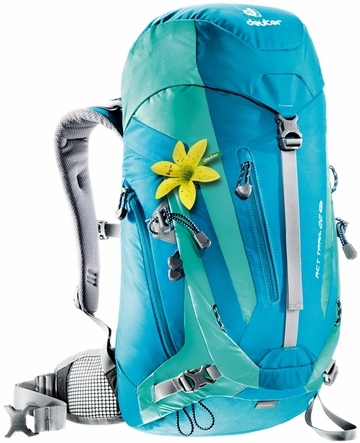 With a new sleek look, this sporty, no-frills pack offers an AirContact backsystem for ideal carrying comfort along with smart details that add extra convenience and style to any adventure. Flexible, tensioned Delrin� U-shaped frame provides stability at minimum weight. It follows the most varied movements with absolute ease. The frame combines with the body-hugging fit to create a compact carry system with even load distribution and effective load transfer. Made from 600 den Polyester thread and with a thick PU coating, this multi-purpose fabric is robust and lightweight. It is most suitable for backpacks, used in average conditions to keep the weight to a minimum. "